This best-of-both-worlds kitchen has warm wood paneling like a cozy cottage but also lets in the breeze on summer evenings. A grill and prep station built right into the well-ventilated space minimizes mealtime trips back into the main house. This outdoor living room and dining room adds 320 square feet to a home that is only 750 square feet to start with. Visitors walk through this open-plan outdoor space on their way to the front door, making it seem as though this small house has a large foyer. With a growing family, a home business, and a large dog vying for space in this 1910 Seattle bungalow, it just made sense to move something outside. Now the family does much of its dining and entertaining on an outdoor patio just off the kitchen. The wide panes of glass and a back door that’s always open on nice days erase the distinction between indoor and outdoor space. This homeowner made an outdoor dining area on a brick patio, using rustic raw wood benches and an iron and marble table. What sounds like a recipe for brutalism is in fact cozy and bohemian, thanks to colorful cushions, lush greenery and flowers, and gauzy, artfully draped table runners. 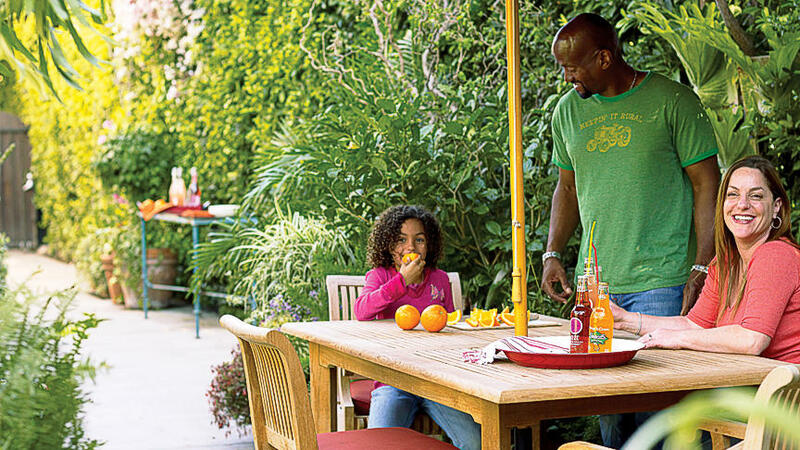 Dress up your outdoor dining room for a season of fun. 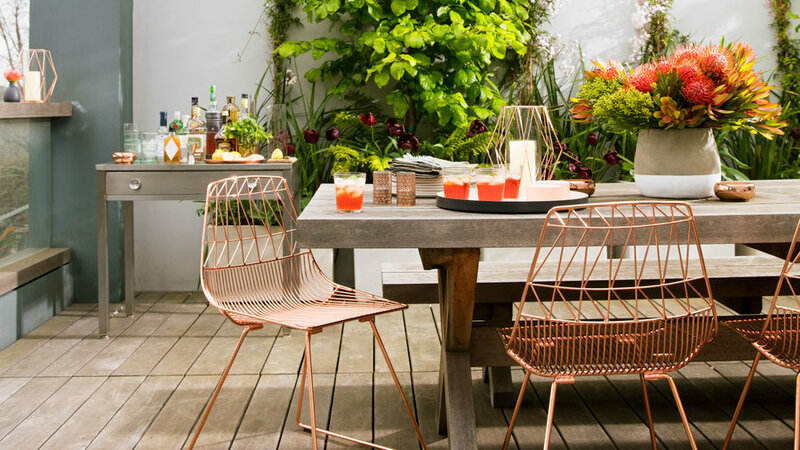 Neutral patio furniture gets a lift when you add chairs in the of-the-moment metallic, copper. These wire chairs from Los Angeles–based Bend Goods will look just as good inside when the season ends. Repurpose a console table from inside to give your spirits setup a sense of permanence—and have a drawer to stash bar tools. When you’re entertaining, incorporate the color of the night's cocktail in the centerpiece: instant theme. The hot pink of pincushion flowers (Leucospermum) looks right at home with a Campari punch. This outdoor living space wins at its texture game. The minimalist dining room interplays rustic wood with a smooth concrete tabletop. Beneath the table, crushed oyster shells create a permeable surface for easy cleanup. If your gardening to-do list includes pruning deciduous shrubs and trees, recycle some of the clippings to make a twinkling natural chandelier. 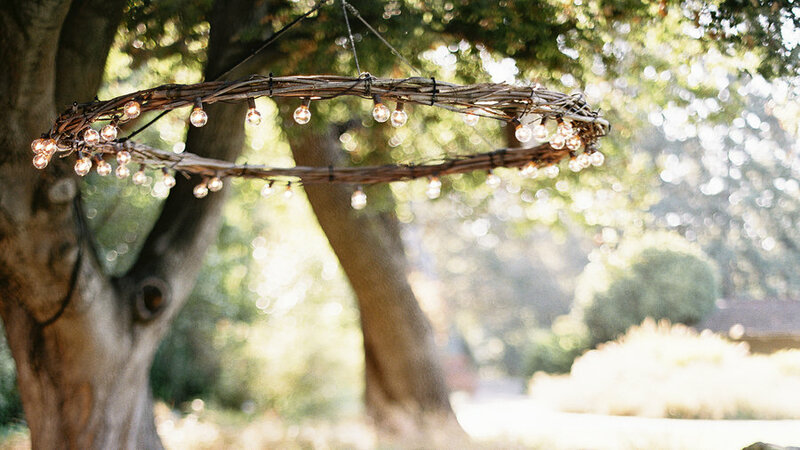 Hang the hoop from a branch above a long table for your next backyard event. Beth Mullins combined old bricks with new, whitewashed ones and laid them in crisp lines for her patio. She then chose a teak outdoor dining table to finish the outdoor area. It’s a great texture contrast with the brick, and it ties in with the fence. “Combining the bricks with the wooden furniture helped the whole look be more modern,” she says. 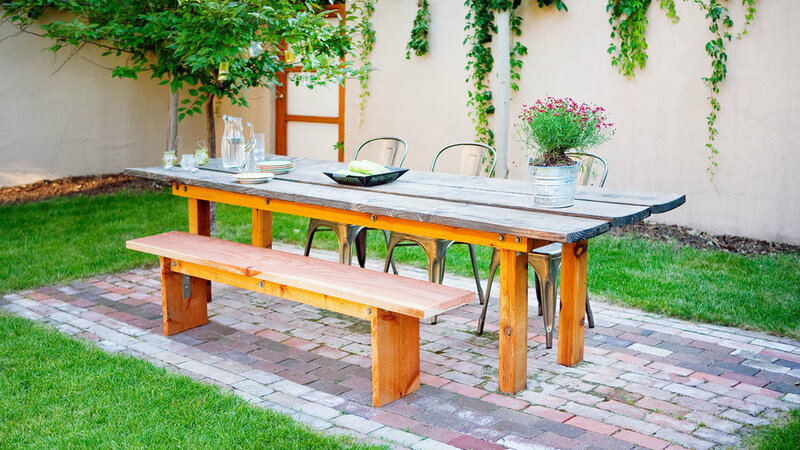 Just big enough for a picnic table, this brick landing creates an outdoor dining room in a small Denver backyard. Homeowner and architect Renée del Gaudio intentionally placed the patio as far from the house as possible so it feels like a retreat. To keep costs down, she and her husband used bricks they unearthed while remodeling their turn-of-the-19th-century home. In the distance, a translucent door lets in light yet maintains privacy. 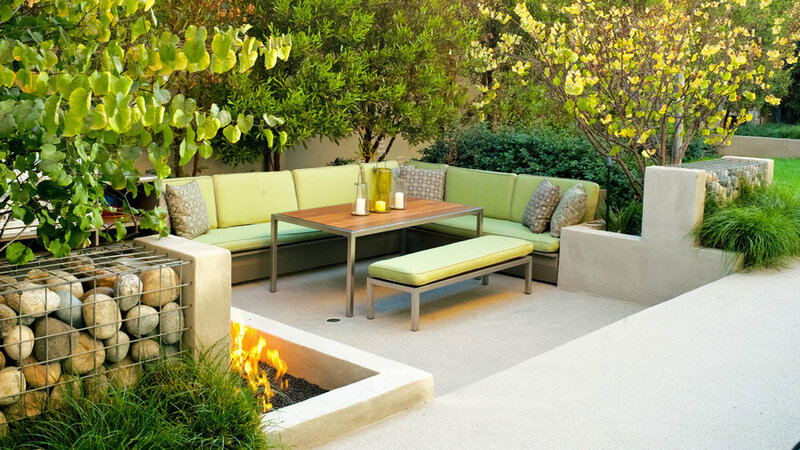 Furniture should come first when designing outdoor rooms. You have to think about what you want out of the space. Is it a table for four? A lounge? 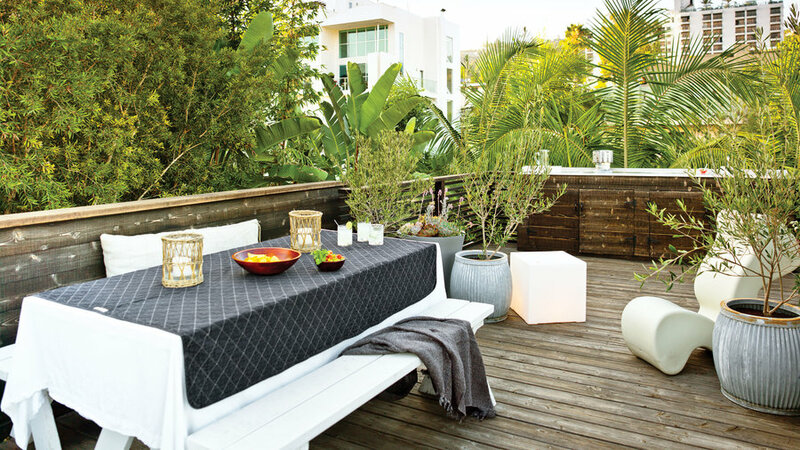 This outdoor dining room is the go-to for larger dinner parties. 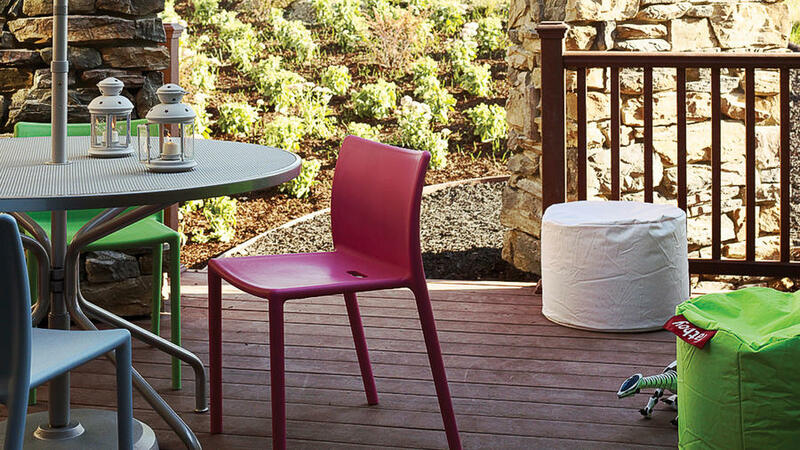 The Janus et Cie table steals the scene. 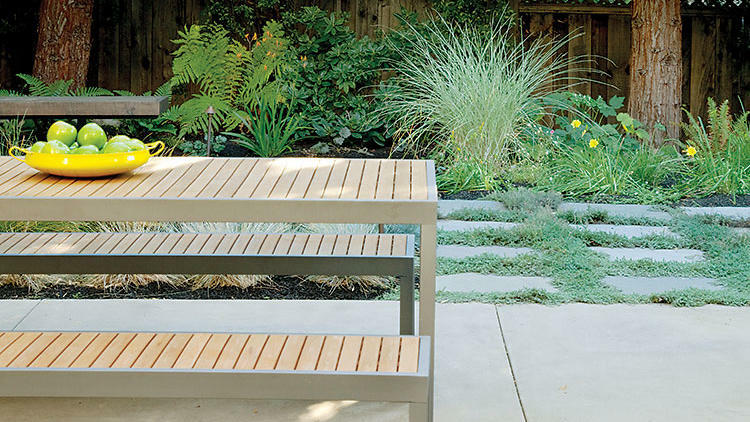 But the space has flexibility—a stone bench and a bistro table also make for more intimate, casual dinners. Tucked into a patio corner near the house, this dining area feels enclosed, thanks to a billowy tea tree (Leptospermum petersonii). Mexican pebbles fill spaces between sand-finished pavers creating a permeable surface. The forest green accents of the table bring out the best of the surrounding foliage. 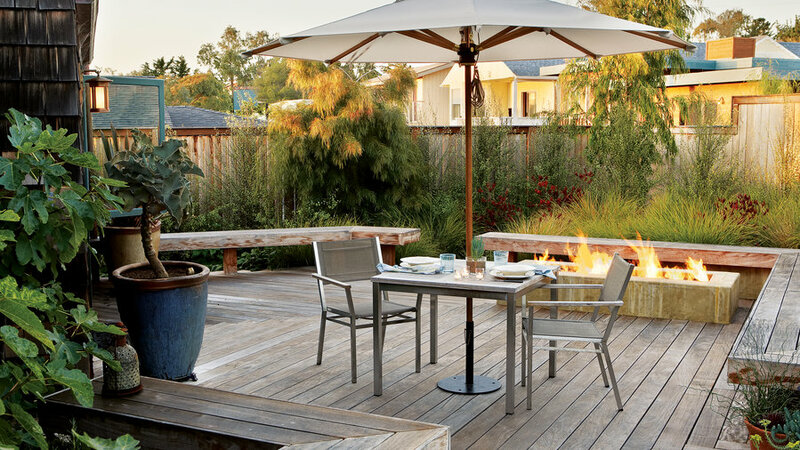 Ideal for a small crowd, this sunken patio in Matt Nuss and Joy Mashaal’s backyard in Venice, California, is perfect for a holiday meal. A built-in firepit warms the cozy space; hopseed bushes lining the wall create a feeling of seclusion year-round, while Western redbuds on either side show off their first touches of fall gold before shedding their leaves. Concrete pavers mimic the herringbone pattern of this home’s kitchen floor. 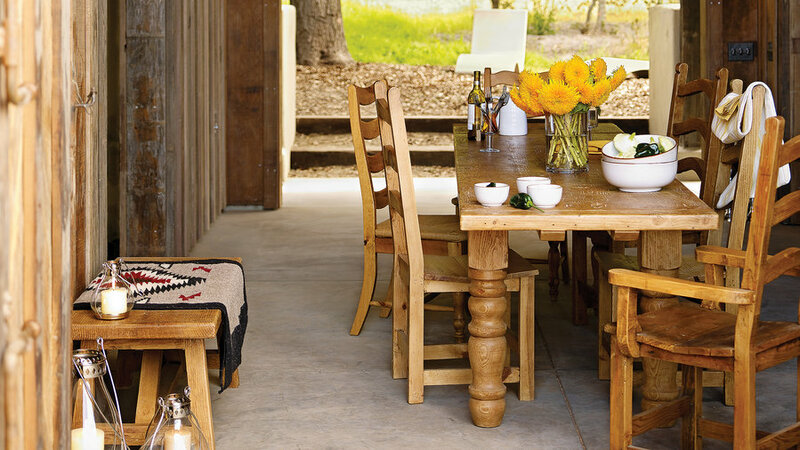 Cushioned wicker chairs slide up to a reclaimed wood farmhouse table for ultimate comfort. Cypress and olive trees on the perimeter of the garden provide privacy and an Italian feel. 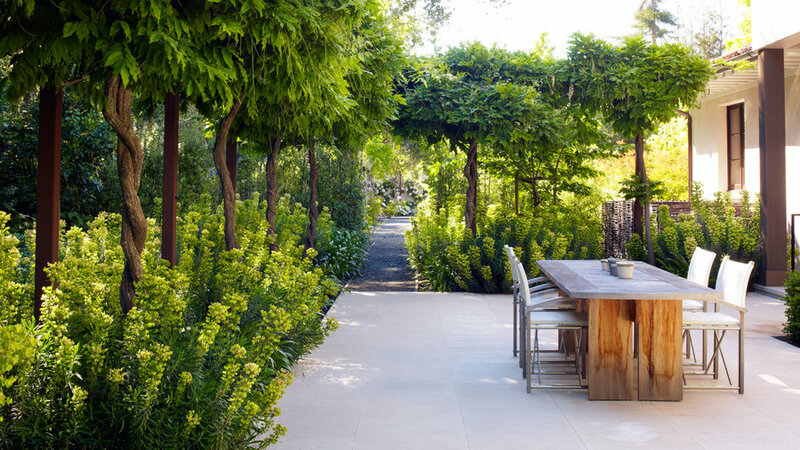 Just two plants transform this outdoor dining room in Atherton, California, into a lush, private retreat. Rambling along a high steel trellis, wisteria dangles fragrant blue-violet flowers and creates a leafy summer canopy. Euphorbia characias ‘Humpty Dumpty’, an evergreen perennial, fills in below; the chartreuse flowerlike bracts add brightness to the understory throughout the season. Both plants are water-wise and need little maintenance. Four Dan Wood stools offer casual seating around a Hive Cement Dining Table. The mixed materials create an informal feel, while the muted colors ensure the space still feels sophisticated and high style. 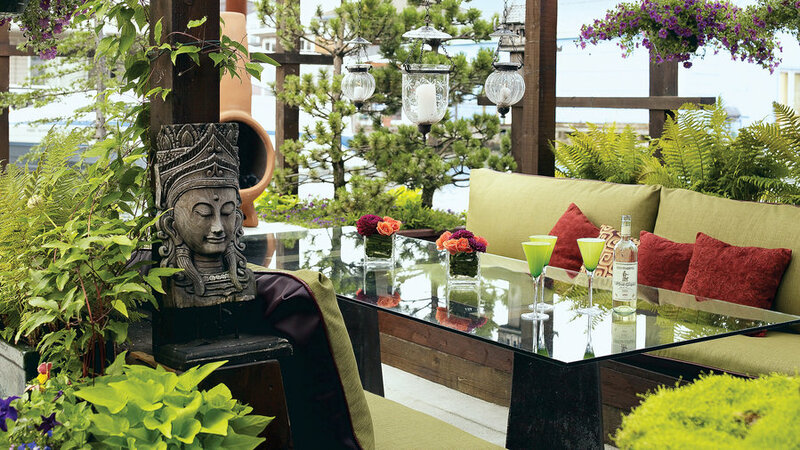 Planter beds on either side create a dedicated outdoor dining room with a sense of intimacy and enclosure. In the spirit of Earth Day, celebrated for the first time in 1970, old materials find new use in the backyard. The deck was constructed from bits and pieces left behind by the house’s previous owners; the farmhouse table and the bench were made from salvaged scaffolding. 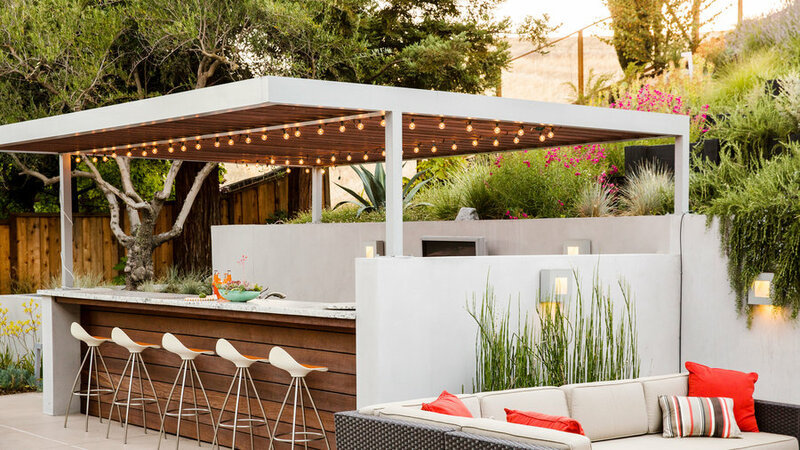 Elaine Barden envisioned her backyard retreat as “Palm Springs meets W Hotel style.” Her designers chose a custom fabricated aluminum arbor above an outdoor bar. The team built it on-site and painted it silver to match the wall sconces. Redwood slats cover the top. 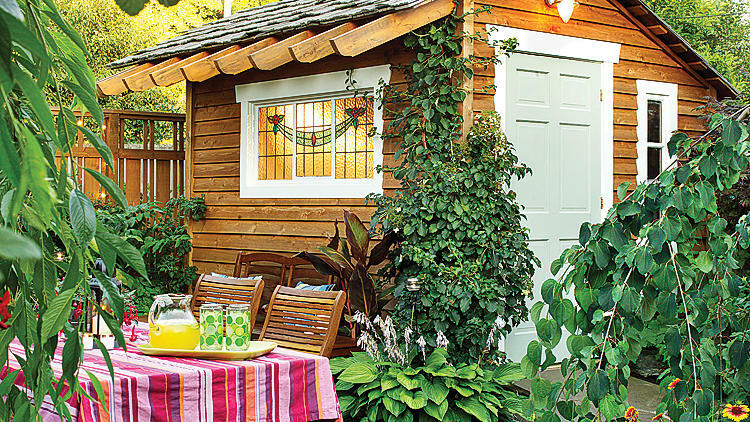 A steel-and-redwood arbor shades this dining patio. 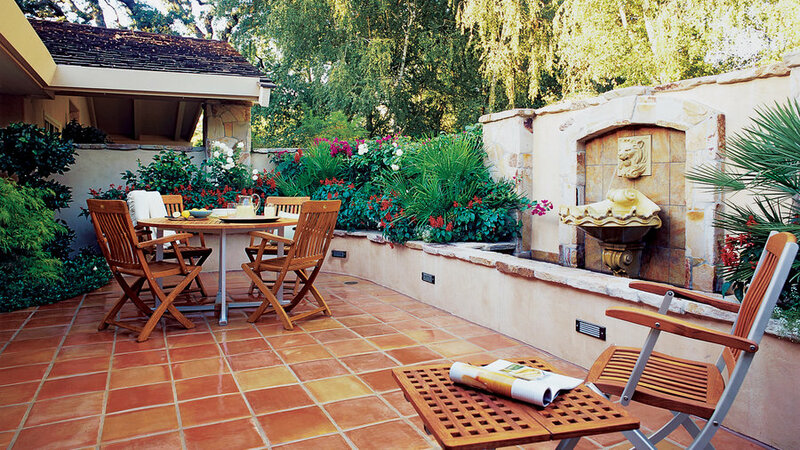 Just beyond this main gathering spot, the square colored concrete pavers create another patio where guests can gather. Woolly thyme grows between pavers beyond. Shipping pallets lurk everywhere: abandoned behind grocery stores, stacked in the corners of big-box parking lots. Bay Area bloggers Matti Salomaki and Megan Speckmann decided to remake a piece of this suburban flotsam into something useful—and beautiful. Taking apart a pallet, they constructed a tabletop from its boards, coated it with natural wax stain, and attached legs they’d found at a garage sale. And the genius touch? A living table runner that consists of a sunken, succulent-filled box (complete with drainage holes) secured to the table’s underside. A pair of red antique school benches that Amy Swift Crosby bought when she was single, and has been toting around ever since, are a perfect match for the distressed dining table. 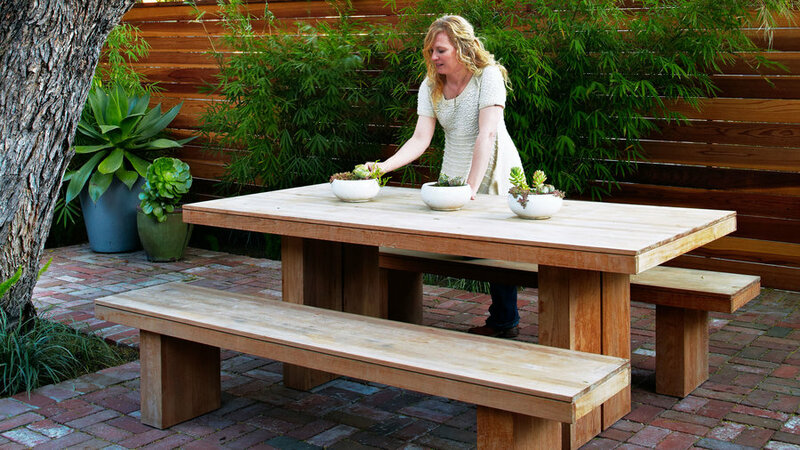 Her husband Josh turned salvage redwood into this sturdy table. 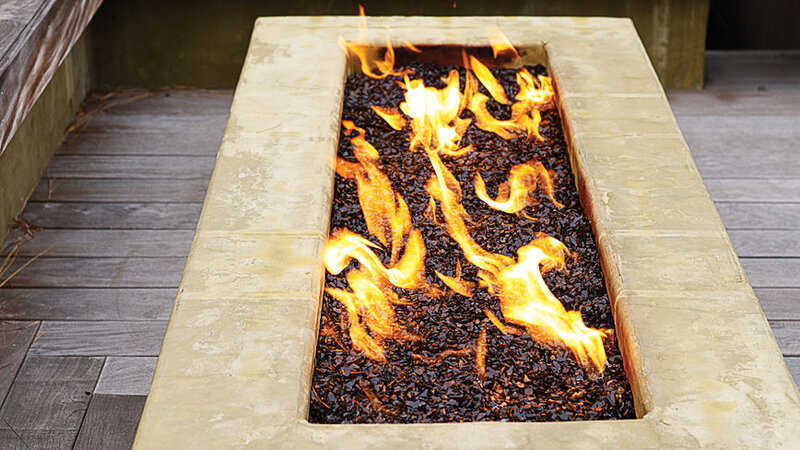 The gravel patio lets excess water flow to the ground beneath. 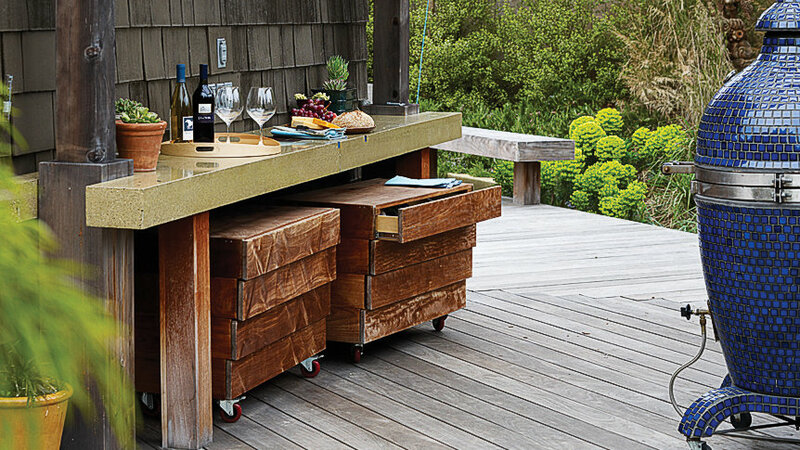 Rectangular chunks of tumbled Connecticut bluestone, set on a bed of decomposed granite and sand, form a 12-foot-diameter dining patio in a wooded Berkeley backyard. 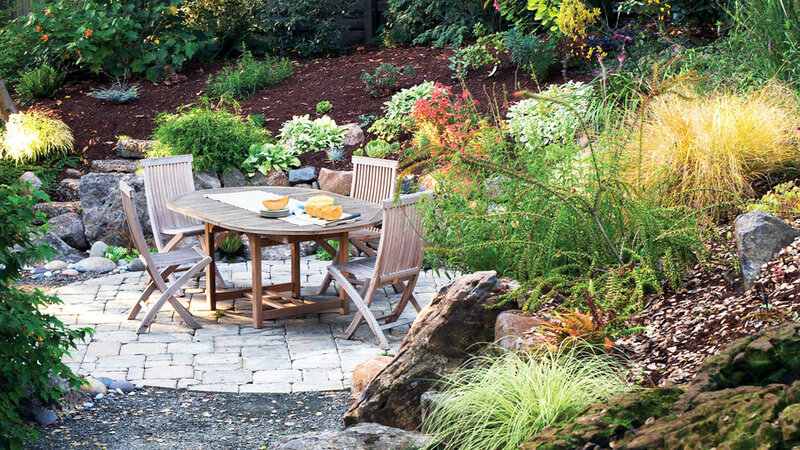 The natural dining set ties perfectly into the fairytale backyard. Big enough to seat eight people and sturdy enough to last a few lifetimes, this dining table could almost pass for Italian terrazzo. But it’s made of concrete, which landscape designer Steve Siegrist cut with a concrete saw from paving in this L.A. backyard during a garden remodel. No grass, no problem. 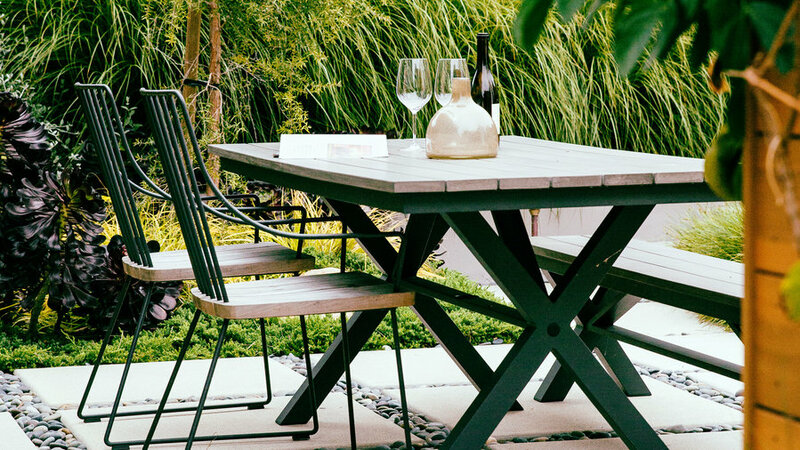 For city dwellers, think upward for your outdoor dining room. “We’ve got a backyard—it’s just on the roof,” says Mark Egerstrom. 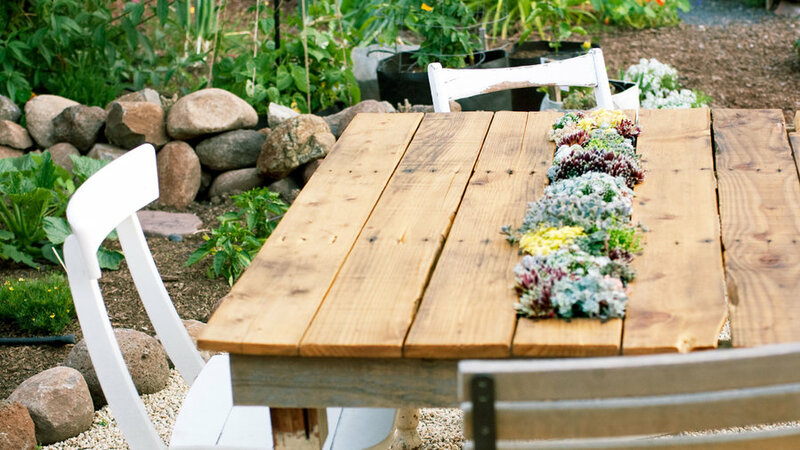 “It feels like a treehouse up there above it all.” Add a chic container garden alongside a simple picnic table for a lush party atmosphere. 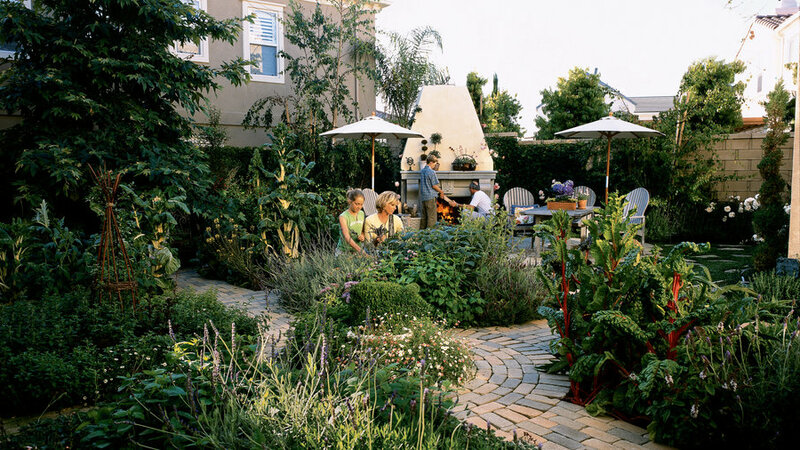 Conor Fitzpatrick turned his Los Angeles backyard into an edible paradise. “There’s no better fruits and vegetables than from your own garden,” Conor says. 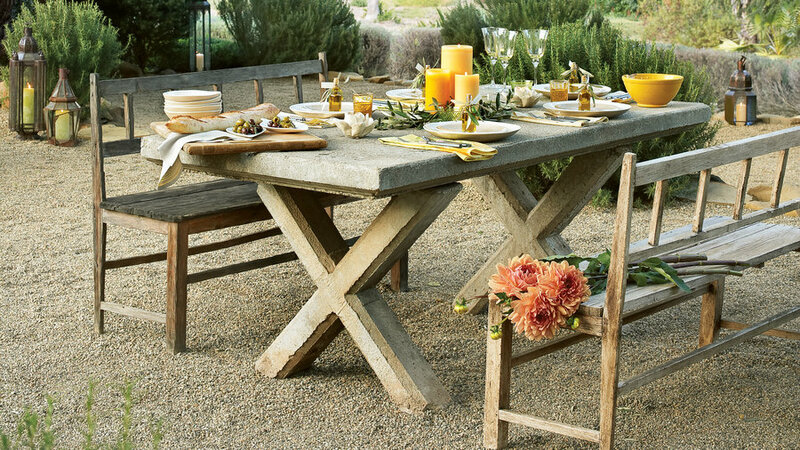 Summer through fall, he prepares his harvest in fresh meals to serve at this cute garden-side table. Simple wood furnishings allow the crops to shine in the dining decor. This open-air dining room features reclaimed redwood siding salvaged from an abandoned water tower that once served a local stage coach station on California's central coast. At 1,800 square feet, Chris and Eric Fenmore's home in Corona del Mar, California, can feel a little snug. 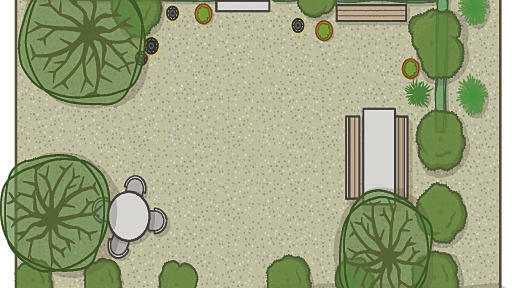 So Chris designed a backyard that lets her move the party outdoors. "Cooking and dining out here are pure pleasures," she says. "I feel like I’m in an elegant campground." 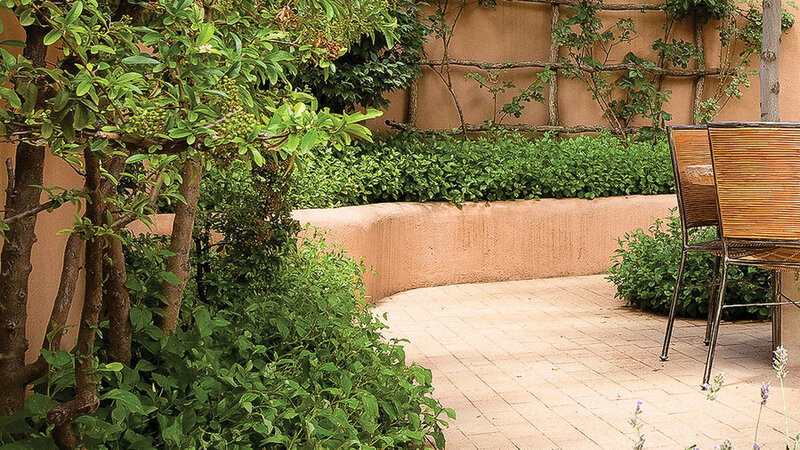 Designer Paul Hendershot calls his Ojai, Calif. garden "a Mediterranean courtyard without walls." 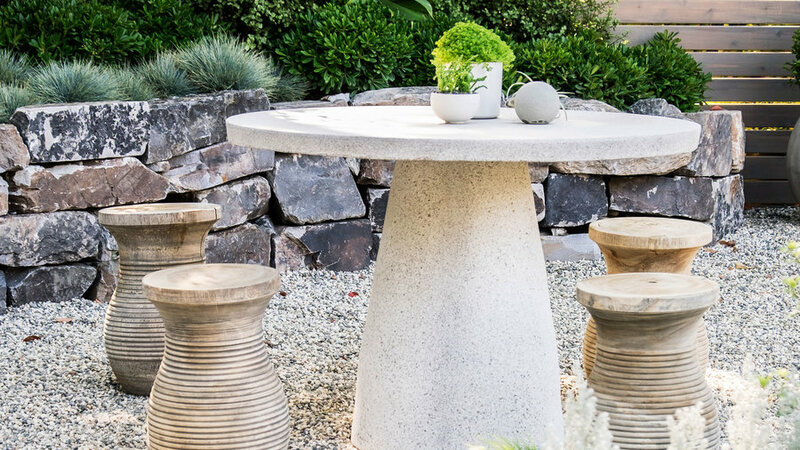 The centerpiece is a concrete-topped table. Inspired by the casual elegance of Mediterranean-style gardens, Hendershot carpeted his patio with pea gravel. "It feels good to walk on when barefoot," he says. A pepper tree provides light shade on hot days. To complement the tree ― and the garden's overall look ― Hendershot also planted boxwood, 'Provence' lavender, Myrtus communis 'Compacta' (which he likes for its scent), and upright rosemary. 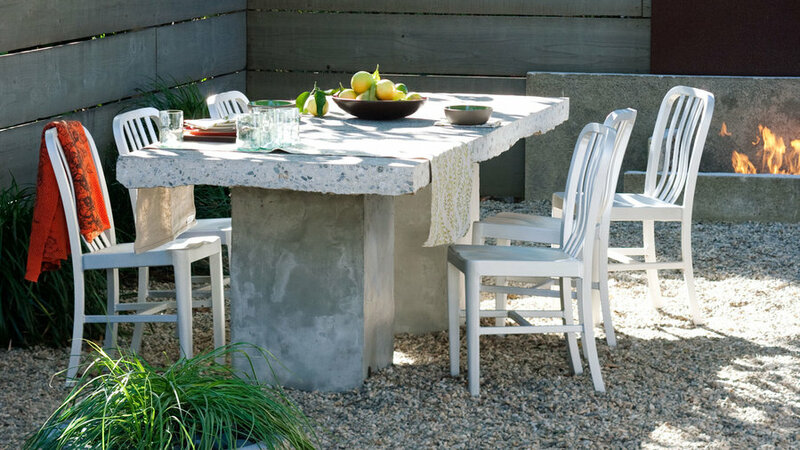 A cast-concrete table is the focal point of the outdoor dining area. "It used to belong to a friend, and I lusted after it for years before I bought it from her," designer Hendershot says. The table has been such a hit with friends that he now takes orders to build similar models on-site in his area (they're too heavy to ship). The benches are weathered pine. Candles and glasses in mixed styles and shades of green and amber look right at home in the casual garden. 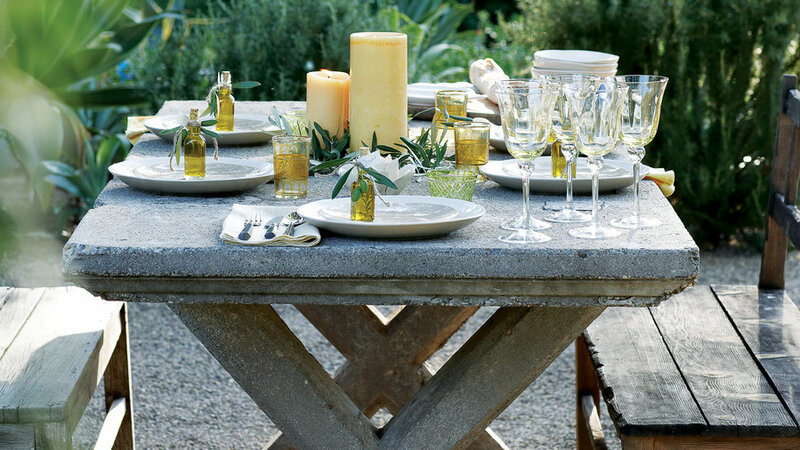 Miniature bottles of olive oil at each place setting double as placecard holders and gifts for guests. An outdoor dining area and a conversation area make up Hendershot's casual, Tuscan-style patio. There's also an outdoor bed, where Hendershot sleeps on balmy summer nights. A rock wall separates the living areas from a lower patio. To give the garden understated elegance at night, Hendershot installed only a couple of landscape lights ― one at the base of the pepper tree, the other at the base of an oak. They're directed up into the tree canopies, bathing the shapely branches in soft light. Candles and Moroccan lanterns provide the rest of the night lighting. The plan shows how the kitchen courtyard, food counter, dining area, and seating work together to create a perfect party space. Built-in countertops in or near the dining area are handy, but if you don't have them, portable carts or side tables will do the job well. 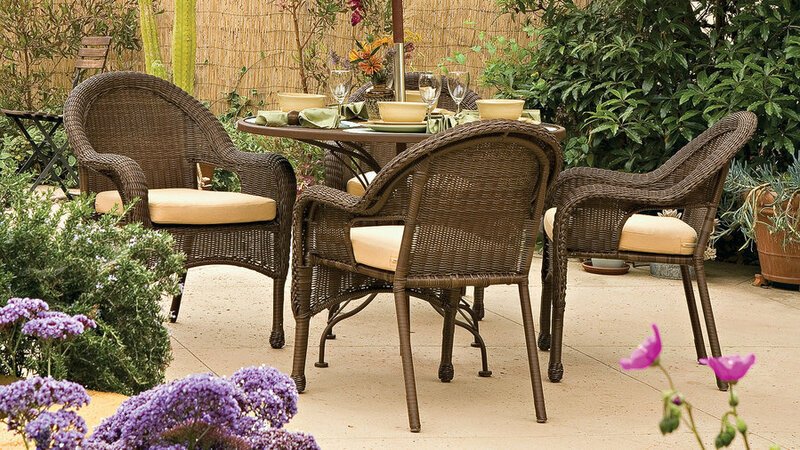 Situate your dinner table under a large tree, patio overhang, vine-covered arbor, pergola, or colorful market umbrella. 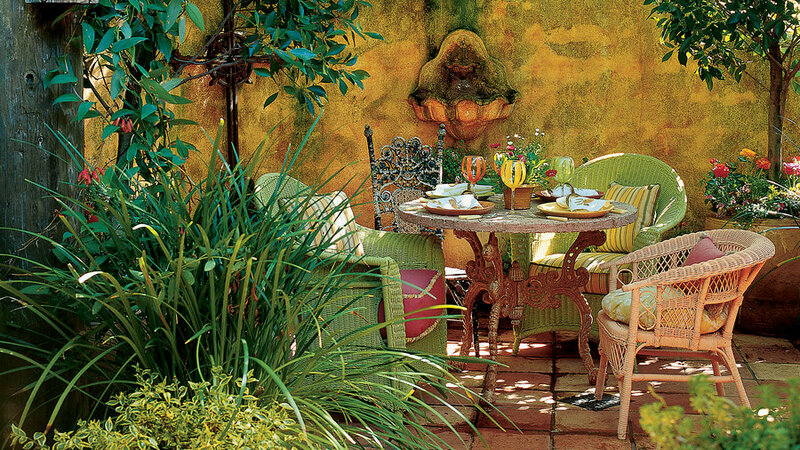 Use your garden to inspire tableware and decorating choices. 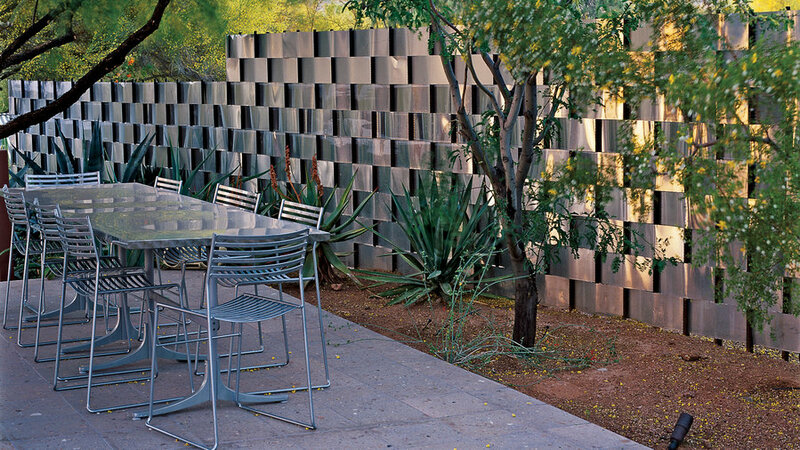 For this project, landscape architect Steve Martino tried something new ― aluminum flashing. He wove it through rebar uprights like a ribbon, creating a glamorous shimmering privacy wall near the outdoor dining area. 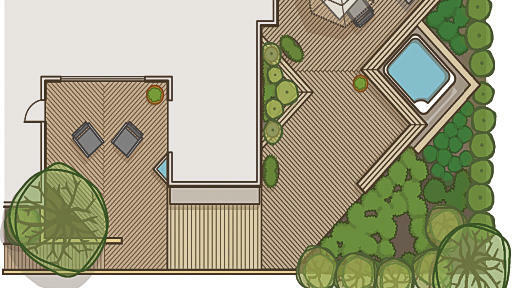 Problem: How do you create an outdoor dining area in a tight backyard against a steep uphill slope? Solution: You dig it out. Armed with pick and shovel, interior designer Linda Applewhite and her husband, Marshall Miller, excavated a 15- by 20-foot semicircular area out of the hillside. 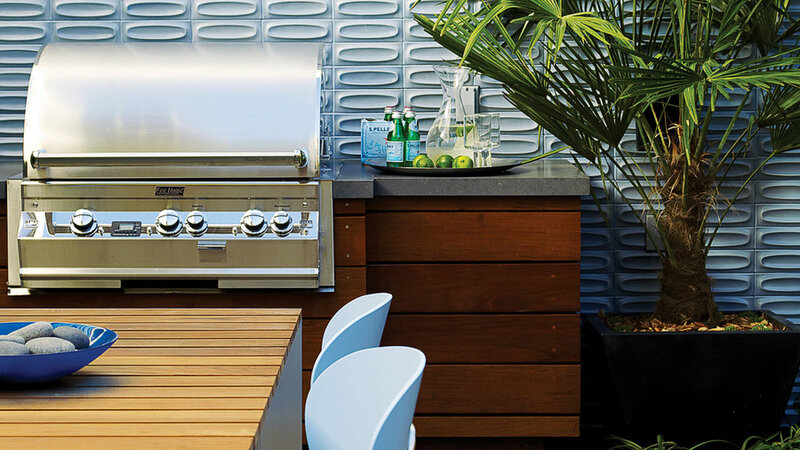 A wall of blue tile from sets the mood for this San Francisco garden dining area, making the backyard feel more like a room. Architect Colin Sarjeant opened up this house and connected it to a new outdoor dining space carved out of the front yard. It's where everyone wants to go. 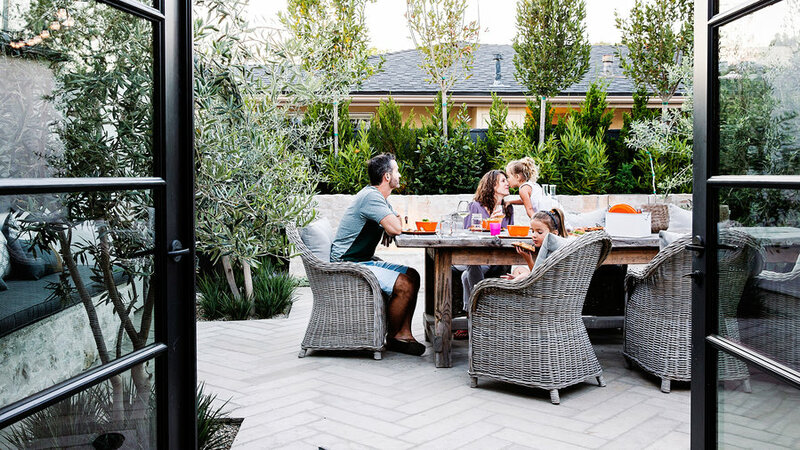 First-time homeowners Jordan and Leanne Rubin ― having only the scantiest experience in construction, design, and gardening ― decided to convert part of a parking pad into a courtyard for summer dining and entertaining. 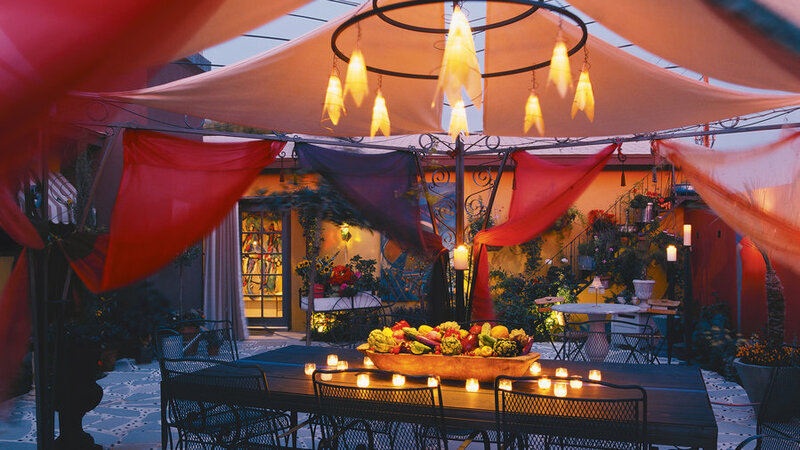 Colorful fabrics give this gazebo drama ― especially when lit from within. Saris form the walls; canvas panels cover the top. The light feature is of steel tubing with fiberglass cones over 20-watt bulbs. When the house gets too warm in summer, homeowners Gabe Gelbart and Paul Rhoadzhagen simply move outdoors to one of the several small open-air rooms they've created to expand their living space. This alfresco dining area is just outside the kitchen; lit by the sun and cooled by the breeze, it consumes zero energy. A cast limestone fountain with an antique finish adds a Mediterranean-inspired accent to this narrow front patio in Sacramento, Calif. The wall blocks the sight and sound of street traffic nearby. This Idea House wraps around a pool courtyard and climbs a hill to capture beautiful hill views. Herbs and vegetables mix with ornamental plants in the front yard. 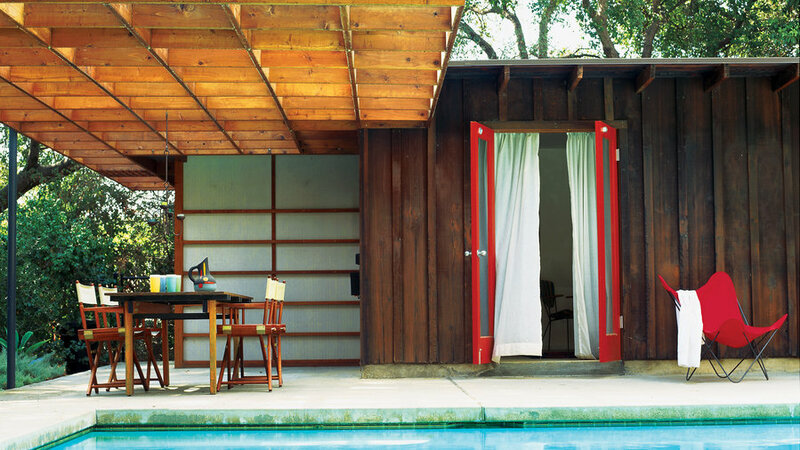 The two-story veranda off the master suite was inspired by a similar feature at playwright Eugene O'Neill's Tao House in nearby Danville, Calif. 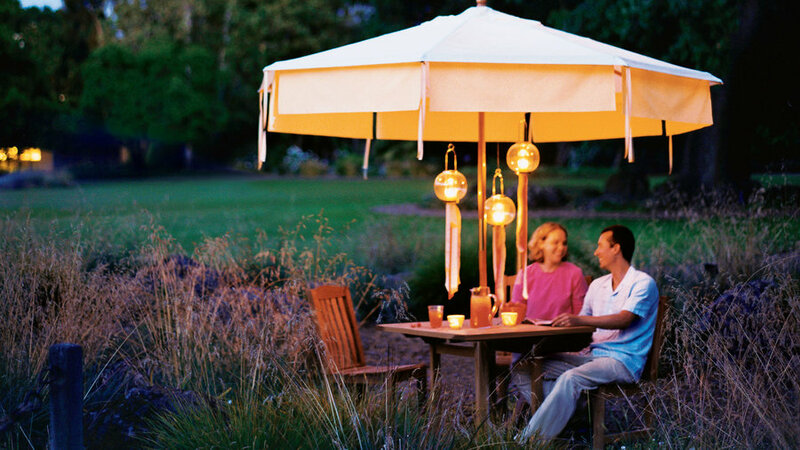 Dress up a few lanterns with ribbon, add some sunny fabric, and your plain canvas umbrella is ready to party. The decorations aren't permanent, so you can change the colors anytime you wish. The Green family use their driveway as a second kitchen and dining room. There’s a barbecue, a sideboard, and a dining table and chairs. To connect the building to the pool and provide a shelter for meals, the architect designed a shade trellis. "Before, it got brutally hot," homeowner Peter Maunu says. "Now we use the area a lot for dining or hanging out." 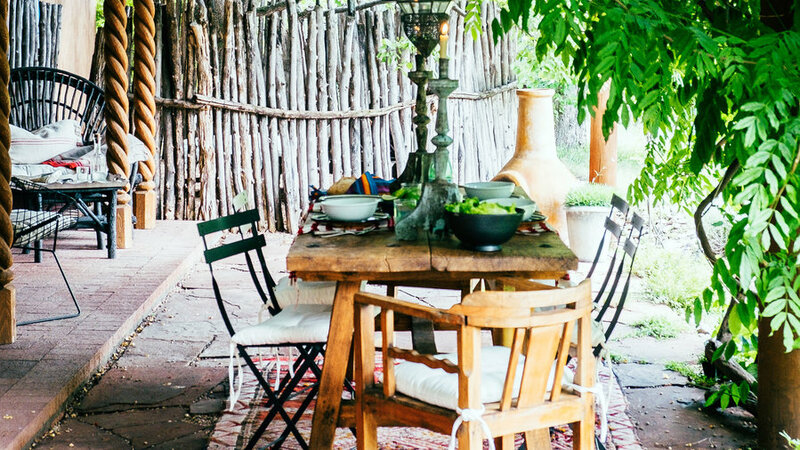 This custom-built dining table is right at home in this Southwestern courtyard. 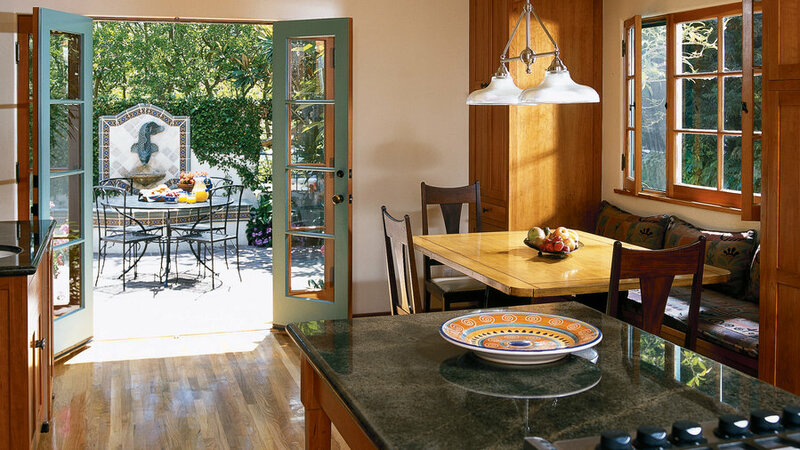 The table is made from the same flagstone as the slender serving counter tucked against the wall. A sunken dining area on Julie Higgs and Dave Stickler's Oregon houseboat is warm-weather central. The table is a salvaged glass door atop ceramic planters. The lushly planted deck often serves as a setting for outdoor feasts replete with pitchers of Tahitian rum cocktails and platters of prawns. It all has the feel of a permanent vacation. 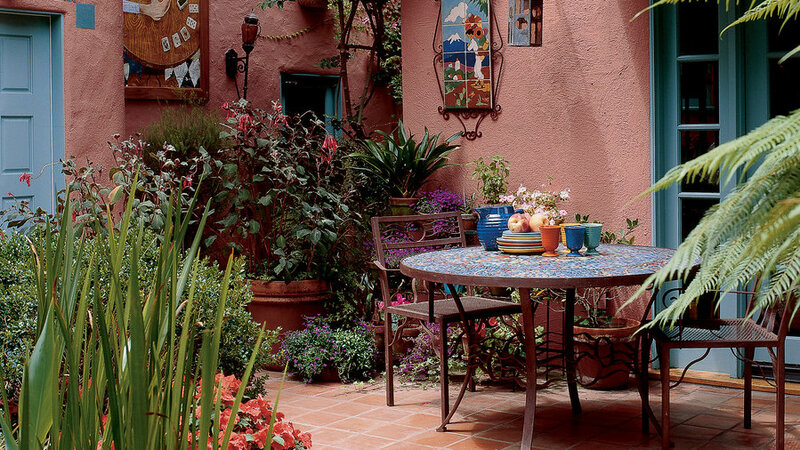 The earthy oranges and Pacific blue tones of the San Jose tile plaque on the wall are repeated in paint, table surface, and flower colors. The painting by Nancy Kintisch was waterproofed for outdoors. 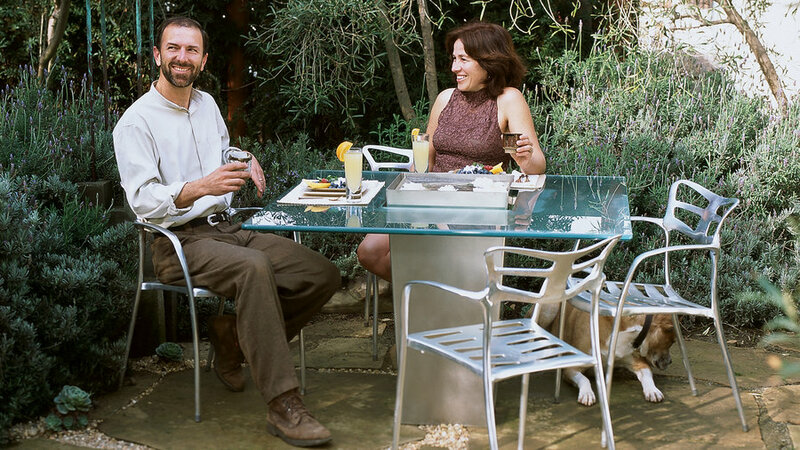 In their rear garden, lined with olive trees, Jeff Reed and Jennifer Madden enjoy an alfresco meal at a sculptural table they created. 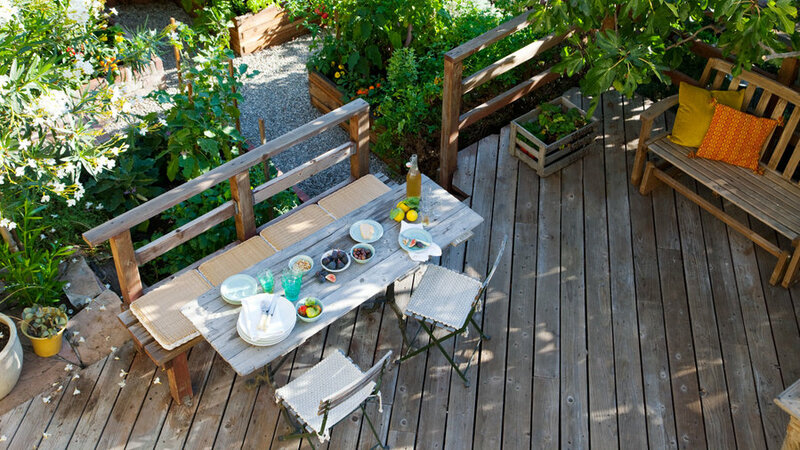 Dining and gardening combine in this elegant potager, where herbs and vegetables grow near the table.